Concentric Storage Systems provides dynamic Pallet Flow and Carton flow systems for warehouses and distribution centers to increase flexibility and storage density of any size product. The time-tested design and product engineering of CSS was purchased this year to continue the sophisticated line of Gravity Flow Systems that Creative Storage Systems spent over 20 years perfecting. All of the Carton Flow and Pallet Flow designs were combined into an exciting new venture called Concentric Storage Systems. Personalized customer service and product testing is what sets Concentric Storage Systems apart from the competition. In-house or on-site product flow testing with actual products and pallet or carton type guarantees flow. 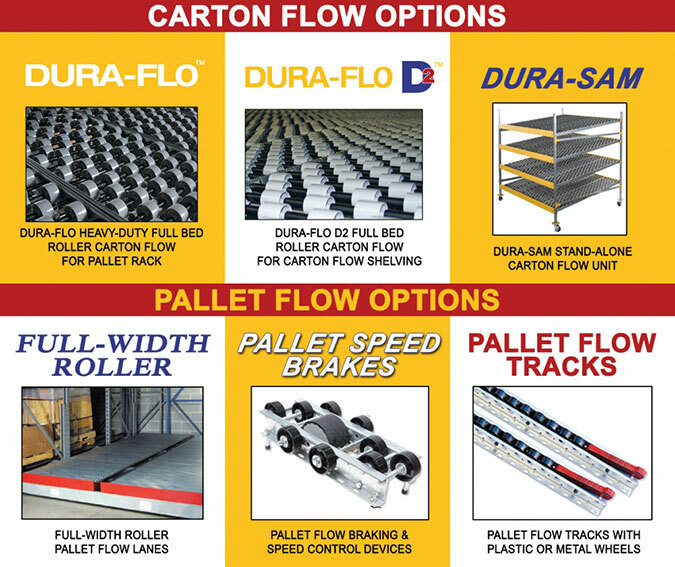 High-performance Carton Flow solutions for pick systems include Dura-Flo and Dura-Flo D2 full-bed roller systems which replace traditional roller tracks with a series of staggered wheel assemblies creating a uniform flow surface with up to 90 percent rack space utilization. Dura-Flo wheel assemblies snap into place using specially designed c-channels with universal connection brackets for easy installation in any manufacturers’ system. Staggered polycarbonate wheels allow any size carton to easily flow across the system without hang-ups and with better tracking than roller systems provide. The solid bed of rollers of Dura-Flo and D2 provide highly flexible storage and adaptabilty for frequent stock changes. Dura-Flo’s taller system fits into any manufacturers’ pallet racking and the low-profile of Dura-Flo D2 drops into any manufacturers’ carton flow shelving offering more vertical clearance on shelves. Both offer more than twice the wheel coverage of the closest competitor’s system. Either carton flow system can be installed into Concentric’s Dura-SAM stand-alone mobile carts, allowing you to easily deploy a picking station anywhere in your facility. A variety of wheeled pallet flow systems suitable for a range of deep flow-through applications feature steel roller tracks capable of supporting pallets up to 5,000 lbs. or durable polycarbonate resin wheels with reinforcing spokes. Concentric offers both regular bearing wheels (including sealed models for specialty applications) as well as bearingless wheels for high-impact and wash-down areas. Concentric pallet flow products can be provided in a variety of in-line or staggered flow track configurations, and can include our specialized brake tracks to controls speeds, ensuring our systems provide safe transit without hang ups for any load. For applications with LIFO stock rotation and non-standard pallets, CSS also offers full-width roller pallet flow systems with 2-track, or 3-track configurations and built in speed controllers to maintain safe flow rates. Concentric Storage Systems offers exceptional service for every Carton Flow and Pallet Flow System from project design and product use. We ensure you get the best possible systems to suit your facility’s needs.